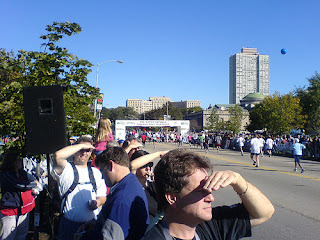 shopnewbalance.com: Cheering for Runners - What Sounds the Best? Cheering for Runners - What Sounds the Best? If a runner hears his or her name in a race among a crowd, that can be a real booster when the going gets tough. It's personalized, friendly, and a nice change from just "Go faster...!" While a runner may not feel like they look that great, especially in heated moments of a race, it's still nice to hear that someone feels they do. And 'Lookin' Good!" can not only mean physically but your running gait, speed, stance, facial expression, etc. insert specific number Miles to GO! Now, this is very important, only say this in a cheer if it is true. Never shout "Only 2 miles to go!" when the runner really has four or five. But it is nice to hear updates if a mile marker was missed, hard to read, etc. Again, only shout this if it is true. You don't want to call out that a race course is downhill when there are four sets of hills on the horizon. So, if you know the course well and know that a downhill is coming, by all means, shout it. OK, this one might be a little lofty, but as a woman, I always like to hear compliments about my apparel choices for race day. I took some time picking this outfit out, so it's nice to hear someone else thinks the shorts are cute too. This might be a "girly" phrase but I enjoy a fashion compliment as much as the next woman runner. It's just a "feel good" cheer. I heard my Dad say this to me after a race, and I thought to myself "where were you at mile 3, Dad!" I could have used the extra pep talk when I was hurting up hill, not as I relax in the after race tent. Letting a friend, relative, or even perfect stranger know that their effort makes you proud, can soar them over the finish line. So, there are our favorites. Nick contributed from his marathon experience, and I contributed from my short distance racing experience. Next time you find yourself on the sidelines cheering on a friend, your mother, wife, husband, child, etc. think of what makes you run faster, and cheer it on. Never miss a chance to tell someone how much you care, especially during a race.